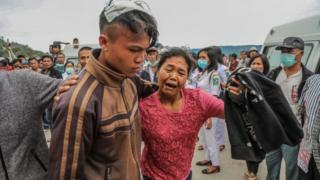 Lake Toba, the world's largest volcanic lake, was busy with Muslim tourists celebrating the annual Eid holiday when the ferry sank in poor weather. Many victims are thought to have been trapped inside the vessel. Indonesia's national search and rescue agency said the survivors had all been found within hours of the disaster and three bodies had been recovered.